It costs one mana. I realize it seems like I’m joking here, but I’m being dead serious. Both historically and in modern Magic there’s something inherently powerful about 1CC cards; not only can you cast them easily and early, but they also combine extremely well with other spells. This creates insane turns that change the nature of an entire game. Elves, Lightning Bolt, Vampiric Tutor, and even current cards like Ponder and Vapor Snag all help exemplify the “power of 1“ in Magic. It gives Trample. The simple truth is that Trample is a very strictly controlled trait in Magic; it’s generally put on large beefy creatures that cost a lot and it serves as a form of pseudo evasion by turning off the option to “chump block”. Giving trample to cheap efficient creatures in the early game is a BIG deal because it allows you to win early creature races and essentially turn off blocking period. At this point in the game virtually every creature cast will be a “chump” and, for reasons we’ll go into later, it’s simply not a good idea to put your 2/2 in front of his 4/2 wearing a Rancor. It gives a relevant +2 bonus to Power. As a general rule I won’t play Auras or Equipment that don’t buff a creature’s power by at least 2, particularly in constructed. Functionally, it has Haste. I’m aware that you have to have a creature in play for this to work but think about it for a moment. Granting +2/0 and Trample for a mere G allows you to push extra damage through while discouraging blocking. Most early beaters typically have 2 power and the return from graveyard clause minimizes the potential of getting 2-for-1’d. Is casting Rancor really all that different from dropping a Goblin Guide turn 2+? Unlike most Auras, Rancor is extremely hard to kill and thus in many ways functions more like an equipment than an Aura. There, naturally, are legitimate ways of dealing with Rancor but it won’t be as simple as Doom Blading the guy wearing it mid combat and that’s what separates this card from “good but not quite good enough” options like Spectral Flight. 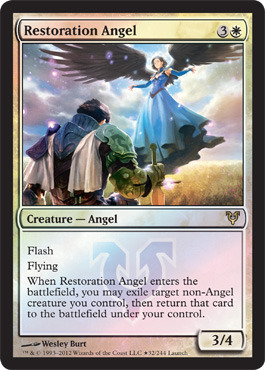 The key to remember here folks is that Rancor doesn’t care how it ends up in the graveyard from play; you can solve Angelic Destiny with a top-decked Vapor Snag/Exile effect, but that’s only going to delay the inevitable with a resolved Rancor. It’s both easy to play and absolutely disgusting in multiples. One of the more subtle aspects of playing with/against Rancor is accounting for the way they tend to accumulate over the course of the game. Due to the return from graveyard clause it’s actually fairly common for 1 Rancor to become 2 and so forth as more copies are drawn without the original Aura being neutralized. In this way it becomes a question not of- What if my opponent draws multiple Rancors and starts turning random Elves into Ball Lightnings but, “When will my opponent start dropping multiple Rancors”. 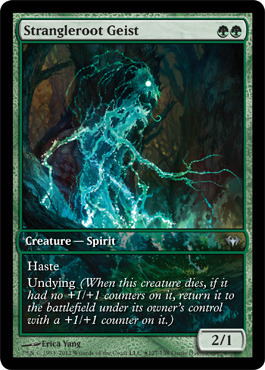 This card is completely worthless unless you have a creature in play or can create one out of thin air (Inkmoth Nexus)- Pretty self explanatory in my opinion; no amount of fancy return from your graveyard clauses can change the fact that creature enchantments need to be attached to creatures. While Rancor is very resilient it’s not invincible- I suspect that this is a lesson most people are going to have to learn on the table but I’ll do by best to explain it here. For Rancor to work it has to actually enter play and attach to a creature; this means that anything that interrupts the attachment will send Rancor to the bin without allowing you to return it. Mana Leaking the Rancor is a good example. Others include dropping Doom Blade/Vapor Snag on the guy you’re going to attach it to before Rancor resolves or otherwise creating an illegal target for the enchantment (Stave Off?). Additionally, exile effects that can target the Rancor itself like Oblivion Ring or Revoke Existence will prevent any sort of recursive shenanigans. Like all cards that return from graveyards, Rancor actually goes to the bin for the briefest of moments. Through the wonders of “the stack” this naturally allows your opponent to remove it from the graveyard at instant speed with effects like Surgical Extraction and Nihil Spellbomb; all before you ever get a chance to put the Aura back in your greedy little mittens. Sure, it costs 1 mana but that 1 mana is Green. Okay, I’m at least partially joking here folks, but historically Green cards don’t exactly have a wonderful batting average in tournament Magic; there are obviously times when Green decks shine but overall it’s earned a reputation as the weaker sister in Magic’s color pie. This stigma seems to be lessening over time as WotC prints more cards like Primeval Titan and Strangleroot Geist, but a simple look at the success of U/W decks over the last two Standard formats will show that we aren’t all the way there yet in terms of Green being an equal partner at the table of competitive Magic. Playing Rancor means you’ll be playing a significant number of Green mana sources and to at least some degree that may not be a good thing. I don’t know about you, but to me that adds up to a very powerful card in a deck designed specifically to take advantage of it. I don’t think it’s “broken” by any means but I expect Rancor to hang around Standard for the entire time it’s legal; lurking in the X-1 bracket and waiting to punish you for underestimating your “silly durdle aggro opponents.” I’m going to spend a lot of nights awake trying to make sure my decks don’t “snap lose to guys and Rancor” and possibly more nights complaining about my opponent “lucking” into multiple copies to ruin my plans in short order. Okay, now that we’ve looked at Rancor in a vacuum let’s talk a little bit about it in the context of Standard constructed formats. This is naturally going to be a little bit tricky because as I’m writing this we’ve seen zero cards from Return to Ravnica and roughly 2/3 of M13. There are a number of things we do know already however; chiefly that all of Innistrad block will remain legal until M13 is due to rotate and that until Return to Ravnica is actually released Rancor will roam free in the Standard environment we’re competing in right now. As always when looking at the future it’s best to study the past; remember the deck I mentioned that finished 3rd and 4th at the 1999 Magic World Championships? Here we see a pretty archetypal example of a “weenie” swarm/stompy deck that uses Rancor as both a kick-start in the early game and a grindy damage engine in the late game. I chose Matt Linde’s version of the deck because he finished 3rd but Raffaele Lo Moro’s 4th place deck was very similar; he ran 2 less land to include a couple of Masticores and a fairly different sideboard. I should also point out that both Gaea’s Cradle and Cursed Scroll did a tremendous amount of work in these decks and I severely doubt we’ll have access to legitimate replacements in “the new” Standard. With that having been noted the simple truth is that most of these creatures are just cheap, disposable guys who can carry a Rancor into battle. There’s some evasion (River Boa), some Regeneration (Albino Troll) and some man-lands (Treetop Village) but otherwise we’re talking about a motley crew of utility Elves and undercosted Bears with significant drawbacks (Pouncing Jaguar, Wild Dogs). We can easily do better than that, both in today’s Standard and with cards we already know will be legal in the post-RTR environment. Linde had Albino Troll; a fairly formidable card for it’s time to be sure but ultimately just one clunky difficult to use creature (Echo). We have Strangleroot Geist, Wolfir Avenger, Gravecrawler, Geralf’s Messenger, and heck even Young Wolf starts to look like a reasonable option with four Rancor in your deck. Whether it’s regenerate, undying or guys you can re-buy from the graveyard it’s pretty easy to find critters in today’s Standard that synergize well with Rancor. You may or may not have noticed but Innistrad block is home to an absolutely massive number of cards that make tokens; particularly 1/1 white flying Spirit tokens. Typically these cards will produce 2 or more such tokens at the same time; thereby giving you an almost endless number of random dudes to attach your Rancors too. 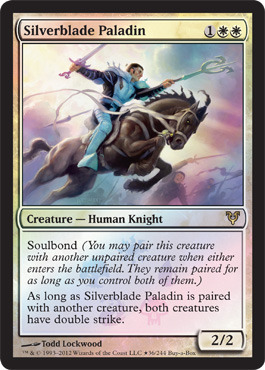 I probably don’t have to tell you this but I will anyways; +2/+0 and Trample is even better at making creature combat irrelevant/unattractive when granted to a flyer. If one of the few ways to neutralize Rancor is to kill or bounce the creature it’s trying to attach to while the Aura is on the stack, it stands to reason that attaching Rancor to a creature your opponent can not target is a logical remedy. This option was not available to players when Rancor was last legal and I expect that this interaction will ultimately go down as extremely unpopular with those who lose to it. Putting a Rancor on Thrun, the Last Troll or a Geist of Saint Traft is pretty sweet both because your opponent can do very little about it and because these critters benefit tremendously from having +2 Power and Trample. The real all-star however just might be M12‘s Dungrove Elder; while I obviously have no inside knowledge of the testing process at WotC, I have an extremely hard time imagining this guy was ever intended to get +2/0 and Trample so easily. Having played against Dungrove numerous times in the current format I can tell you that aside from sweeping the board the only really good way to deal with him is endless chump-blocking with tokens/undying guys and otherwise disposable men. That option will now be closed and I’m more than just a little worried about facing down “The Elder” once M13 hits the format. As previously mentioned, Rancor is pretty good on flying creatures as a whole; generally because creatures with flying typically have lower toughness than their groundpounding counterparts. Since most “air to air combat” scenarios in a game of Magic will involve racing it’s pretty easy to see why giving your little birdies +2/0 and Trample is a good idea. What may be less obvious however is how amazingly Rancor interacts with creatures that “appear out of nowhere”. Think about current Standard for a moment; how many times have you lost a game to a Delver when your opponent flashed in a Snapcaster on your endstep for little or no profit and immediately on his turn suited it up with a Sword and killed you? Flash creatures tend to be small and have low power for entirely this reason but a card like Rancor provides a cheap, reliable way to turn these little ankle biters into lethal threats. Moorland Haunt tokens, Wolfir Avenger and Restoration Angel would apply here as well. If you’re looking for the ultimate way to guarantee you connect with your Rancors you can always put it on Invisible Stalker and crash away until your heart is content. On the plus side, we’re probably only going to have to deal with this interaction for a little over 3 months; I have my doubts that there will be any Infect creatures in either Return to Ravnica or M13. Unfortunately until that time the seductive allure of turn 3/4 Poison kills will ensure that this deck-type will be popular. Particularly in smaller/more casual (FNM) tournaments. I’ve never been one to subscribe to the theory that Infect damage is worth “twice as much” as regular damage but that’s because Infect critters tend to have absolutely horrible stat-lines and mostly irrelevant abilities. 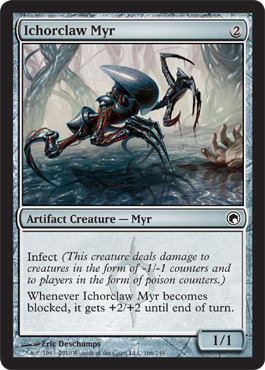 There’s an opportunity cost to rocking poison inherently built into the mechanic and generally speaking Infect creatures aren’t supposed to have trample and +2 Power. If you think Infect staples like Mutagenic Growth and Livewire Lash were annoying before wait until you see them in combination with Rancor. I should also mention here that Rancor combines extremely well with Inkmoth Nexus because unlike most Auras it will return to your hand after the Nexus stops being a guy and starts being a land. As anyone who’s ever played against Nexus + Tempered Steel or Wolf Run Ramp can attest- giving your Nexus 3 or more power tends to end games quite quickly. Truthfully I have my doubts that the Exalted mechanic is going to be particularly playable in the post-M13 Standard format. Generally Exalted encourages you to do something that isn’t a great idea in Magic as a whole; attack with one big creature while leaving back a bunch of random support dudes. This naturally encourages chump blocking and gives your opponent the ability to use his removal spells as Fogs. There is, however, at least one Exalted creature in M13 I expect to play in Standard (Sublime Archangel) and oddly enough Rancor helps with both of the major problems giving all of your creatures Exalted will present. First and foremost chump blocking becomes a joke but being able to return the Rancor and restart the Exalted beatdown in the face of removal doesn’t hurt either. While I’m sure I’ve missed a few silly Rancor tricks you can perform here in Standard, as you can see there really is no shortage of ways to get extra value out of this card in the format. Just yesterday evening a team-mate and I were discussing the possibility of combining Rancor and Champion of Lambholt to create a mini-Falter (once the rotation of Gut Shot makes it possible to play The Champ that is). This is all besides the point that Rancor literally makes any creature a legitimate threat in its own right; there’s something incredible about watching your opponent waste a kill spell on your Lawnmower Elf just so he doesn’t die to the Rancors he’s wearing. PS – My boyfriend has asked me to include his official complaint that this article doesn’t mention Argothian Enchantress, Auratog or Endless Wurm. Apparently we’re only 3 reprints away from Magic being “freaking awesome again”. It must be love folks, that’s all I can say.